$30.00 per month – to place an Offer, Listing or Ad below. $75.00 per month – to add a linked image on our Home Page, along with your Offer, Listing or Ad below. To submit your Special Offer, Listing or Ad for this page, or for more details, please e-mail us at Info@GoldcoastBallroom.com. Come to FREE Group Classes (Complimentary with Paid Admission to certain of our Social Dances) at Goldcoast Ballroom! Every Month Goldcoast Ballroom offers Several FREE Group Classes (Complimentary with paid admission to certain of our Social Dances)! Check out our Dynamic Online Calendar of Group Classes & Social Dance Events offered at Goldcoast Ballroom! 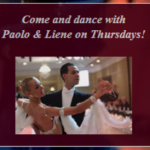 Come & Dance with Paolo & Liene Every Thursday Evening!